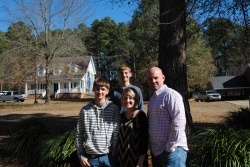 Adoption Profile - Adoption Story - Hopeful adoptive parents, Chris and Amy, wish to adopt a baby. The minute Chris and I were married, we knew we wanted to start a family of our own. I have two biological sons that instantly fell in love with Chris and vice versa. Seeing how much love was shared between Chris and the boys, we immediately started trying to have a child of our own. Since 2005 we began pursuing the idea of starting a family. After a couple of years trying to get pregnant without success, we sought medical assistance. The doctors told us that it was unlikely we would ever conceive. The news was heartbreaking. All of the plans we had made were built around us having children and expanding our family. As we dealt with the emotions surrounding the news, we prayed for guidance. We both started to get these feelings that the Lord was preparing our hearts to adopt a child. We talked to Noah and Jacob, and they were on board immediately. No matter biological or adopted we are all God's children. We will love no different. Love covers everything. We, along with our children, will see the child God has placed in mind for us as the most amazing, precious blessing ever received. We met through mutual friends. We spoke on the phone first before Chris visited me. On that visit, we knew there was something there. We talked for hours and we knew right away we would spend the rest of our lives together. We did so many fun and exciting things while we were dating! We went to lots of baseball games, went to the movies, ate at tons of restaurants, and took a few out of town getaways. The courtship was amazing because it gave us time to solidify our bond and experience life together as a couple. 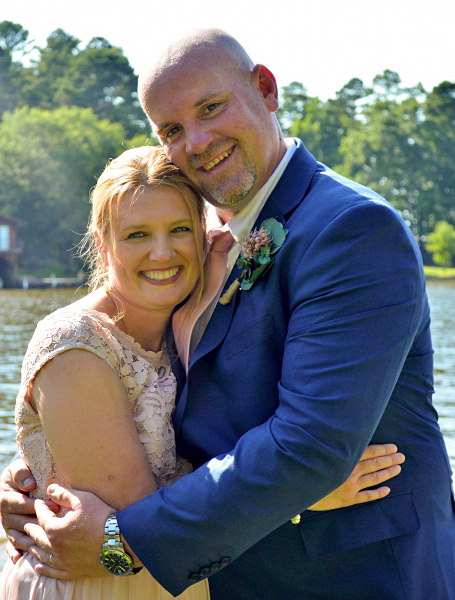 We knew it was meant to be and nine months after our first date, we were married. We had a small, beautiful ceremony with all or family and closest friends supporting us. Besides being deeply in love with other, we are also best friends! We live in a small cul-de-sac. Our quiet neighborhood has a good mix of families with young children and older couples with teenagers and even grandchildren. Our house is a story and half with two bedrooms upstairs and the master and one bedroom downstairs across from the master bedroom. It has lots of big windows to let in natural light and to see our fenced in backyard with a view of the woods behind it. The yard is perfect for a swing set. Our home and neighborhood feel to us like a quiet sanctuary to relax and spend time together. We chose this home because we envisioned raising Noah and Jacob and our future kids here. Our community has a great 10-acre private pond that we enjoy fishing in. There is a creek that runs behind our house that Jacob loves to play in as well as catch fish and frogs in. We also love this area for the great schools. All of our public schools are within 5 miles of our house, very diverse, and all are top rated. They say opposites attract and, for us, that is true. Chris' personality balances mine in so many ways. When I am shy, he helps me fit in. When I am cautious, he helps me take chances. 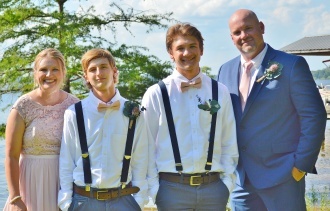 Chris is a wonderful husband, step-father, brother, son, and friend. We work together, play together, and worship together. When we met, he was an answer to my prayers. I am always in awe of his calming force. His patience never ceases to amaze me. He always thinks through a situation and finds a possible solution. His loyalty to friends and family makes me respect him even more. He is a wonderful husband and I have witnessed him first hand become an amazing "father". Noah and Jacob are his "best buddies" and have been since Chris entered our lives. If I ever doubt myself or get discourages, he is always there for me. We share common goals and always strive to fulfill each other's needs. My favorite thing about Chris is that he is who he is. Chris is consistent regardless of who he is around. Another quality I enjoy is his humor. He is a big kid at heart and is constantly making me laugh and sometimes even snort! He enjoys talking with other people and has a "gift for gab"! Needless to say, I love this man and can't imagine my life without him. Chris a hard worker and is very successful in his career as a teacher and athletic trainer. He has provided for our family with a comfortable lifestyle. He has formed strong friendships at work and he is well respected by his employers and co-workers. Chris enjoys spending time with family and friends. He loves to talk baseball with Noah and Jacob. We love to try new restaurants and Chris is always eager to find the ones that have been featured on Diners, Drive-ins, and Dives. There is old saying that when you meet someone, you'll just know that they are the one. I knew Amy was the one for me the first time I talked to her on the phone; heck, we talked to 4 in the morning that first night! Amy is our fuel that keeps us going around our house and the glue that keeps everything together. She is caring, loving, nurturing, selfless, and just a beautiful person. Amy loves Noah and Jacob with every ounce of her being, and Amy puts our needs ahead of hers in every instance. On top of taking care of the boys and me, she also has the responsibility of taking care of her mother who is in the local nursing home. Amy is a wonderful wife, mother, daughter, and friend, and by far, my best friend. She is my sponge; I confide in her about all my troubles and my joys. As years have passed, our marital bond has strengthened through our friendship, allowing us to grow together as spouses and as Christians. Amy is a strong Christian woman, seeking direction in prayer each day. She is genuinely straightforward, confident, and vocal. What you see is what you get, and she will tell you exactly what she is thinking. She is funny when she laughs cause if she laughs too hard, she will snort. It's adorable. She is an awesome cook, and trust me; we love to eat especially myself. She loves crafts and beautifying our home with projects both inside and out. She has a green thumb as well, and loves her flowers around the house. Amy is a go-getter. She is driven, motivated, passionate, intense, and hard working with an astounding work ethic. If she sets her mind to do something, she is going to do it promptly and to the best of her ability. These qualities have allowed Amy to have a successful career in education as a teacher, a principal, and now as a supervisor at the district office. Amy is compassionate for her school kids, guiding every student to pursue a strong education. Amy is definitely my better half, my best friend, and my soul mate. I can't picture my life without her.